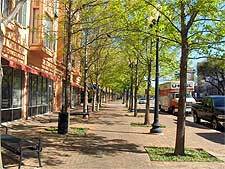 Irving is a fairly youthful city and a part of the Dallas / Fort Worth metroplex, being home to more than 200,000 residents. 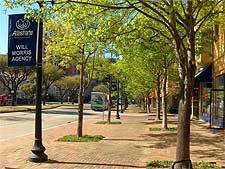 The city was previously known as Gorbit and then Kit, before Irving was eventually founded in 1903 by Otis Brown and Otto Schukze. As such, the history of this city is a relatively short one, but fascinating nonetheless. 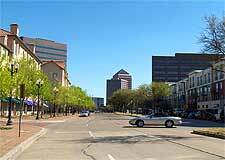 There is an interesting story behind the city's name, relating to American author Washington Irving. It is believed that Otis Brown's wife, Netta Barcus Brown, admired the author, leading Irving to be chosen as the city's name. In 1914, it was incorporated as a city and Otis Brown became the very first mayor. Growth was fairly sluggish during its earliest years, although the settlement had established its first public schools by 1909, and had grown to accommodate more than 300 residents by 1925. The 1920s saw the introduction of electricity, running water and a fire service, yet the economy still primarily relied on agriculture and the cotton trade. However, all that changed from the 1930s, as Irving established a successful manufacturing industry. The Dallas Fort Worth International Airport was built from 1969 and is partly located in Irving. The airport was completed in 1973 and commemorated by a Concorde landing - the first landing of its kind in the USA. The airport became fully operational in 1974 and has since grown to include five terminals with a combined total of more than 150 gates. Currently, over 60 million passengers pass through the airport annually, making it rank amongst the world's busiest. Las Colinas is an upmarket development in the suburbs, close to the Dallas Fort Worth International Airport. 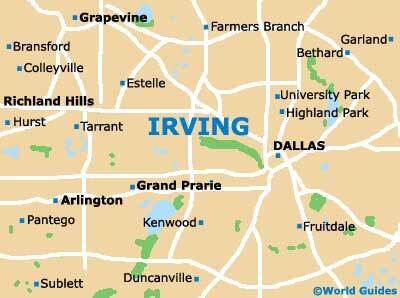 It has an important place in Irving history since it was among the first planned communities of its type in the USA. Development began in 1972 and construction accelerated during the boom of the 1980s. 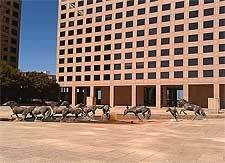 By this time, a number of multinationals, such as Exxon Mobil and Kimberley-Clark, had set up offices in Las Colinas. Debt drove out some of the corporations, but many remain, due to the district's first-class location near the airport. Nowadays, the community is best known for hosting a plethora of golf courses, the Irving Convention Center and the Mustangs at Las Colinas. Located in Williams Square, the latter is the world's biggest equestrian sculpture and a magnificent sight. Irving hosted one of the most famous teams in National Football League (NFL) history, the Dallas Cowboys, from 1971 to 2008. The Cowboys played at the Texas Stadium, a 65,000-seater stadium which replaced the Cotton Bowl in 1971. Unfortunately, visitors to Irving can no longer visit the Texas Stadium, since it was demolished in 2010. However, they can visit the Dallas Cowboys' new stadium in nearby Arlington. Of interest, the stadium hosted a number of other important events besides NFL football. In 1994, for example, it staged the biggest Christian concert ever seen. One of the blackest days in Irving history occurred on 2nd August 1985, when Delta Air Lines Flight 191 crashed while approaching the Dallas Fort Worth International Airport. Total fatalities eventually numbered 137, including one man who was driving along State Highway 114 as the plane came down. Passengers arriving at the airport today can see a poignant memorial to the accident, at Founder's Plaza.